Every now and again, I like to tune in to Dave Rodigan's reggae show on Radio 2. Informed but informal, Rodigan has a vast knowledge of roots and ska and dancehall, but he wears it lightly. In common with Gilles Peterson on 6 Music or Pete Tong on Radio 1, it's one of those specialist programmes where you can feel the passion seeping through your speakers. Last night's show ended with a track by a new artist hailing from Kingston, Jamaica - via Falmouth in the south of England. 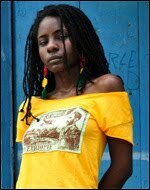 29-year-old Janine Elizabeth Cunningham goes by the stage name Jah 9, and her nimble, jazz inflections breathe new life into the genre's chukka-chukka rhythms. If Erykah Badu converted to Rastafarianism, she might sound something like this. Check out the track Brothers below (it's taken from the fantastically-named Silly Walks Discotheque compilation) and keep an eye on Janine's Twitter feed for details of her debut album, due out later this summer.